This dynamic resource complements Edward Shanken's books Art and Electronic Media (Phaidon, 2009) and Inventar el Futuro: arte - electricidad - nuevos medios (Departamento de Ficción, 2013). The growing number of images, videos, texts, and links provided here offer additional information and multimedia documentation about work by individuals, groups, and institutions that have made valuable contributions to the discourses of electronic art. The site follows the book's organization in seven thematic streams but can also be searched by keyword and tag-cloud links. You don't need to register to explore content but registered users can access a rich interface to submit entries that will be considered for publication. Additional functionality and content are under development, and your contributions to that process are welcome. We hope that this resource will assist in the process of teaching and learning and are grateful for your submissions and feedback. London-based artist John Walter spent three years studying with Greg Towers at UCL to better understand the interactions between a virus and its host, specifically HIV-1 and the effect of AIDS on the human body's immune system. His meticulous research is shown in his new multimedia project CAPSID, featuring a short film titled A Virus Walks Into a Bar, which pulls the "bar" motif of British soap operas to present an analogous tale of how HIV enters human cells and destroys them from within. Through this film - as well as paintings and installations - Walter's work not only uncovers new ways of expressing how HIV behaves, but presents his findings in a way that the non-scientifically-inclined can understand. Written as part of Currents New Media Festival 2015 workshop led by Edward Shanken and Yolande Harris. Two women: one is young, angelic, billowing and dream like; the other alternates between the fetal position and the floating corpse pose. Side by side, the wood framed vessels into which the the images are projected and submerged in water, read as both boat and coffin. Like flowers dropped from the installation’s peeling wallpaper or the Chinese screens described by the narrator as she recounts a dream that turns into a nightmare, the water is the source of life of death. In Two Women, the gasping for air is visceral as the older woman contorts her body and I, the witness, listen to her story in Korean, read it in English and hear the stylus punctuate it into fabric as Morse code, the universal language associated with distress. 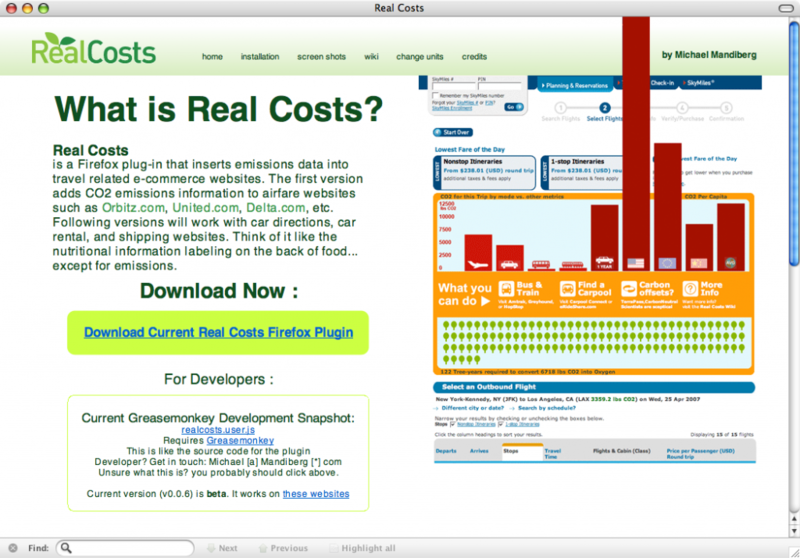 The Real Costs consists of an open-source Firefox web browser plug-in that inserts CO2 emissions data into airplane travel e-commerce websites such as Orbitz.com, United.com, Delta.com, and so on. Like the nutritional information labeling included on food packaging, this plug-in provides emissions information that is otherwise excluded from travel websites. Instead of a search for travel returning the cost in dollars, The Real Costs informs travellers of the cost of their journey in carbon emisssions and the number of tree-years required to offset it, along with comparative carbon footprint information for other forms of travel. Another graph shows per-capita carbon output by country, with the US off the chart. compare with Eliasson's Weather Project; see Robert Mallary's essay, "Six Levels of Cybernetics"
Artist Tao Sambolec's expanded conception of art emphasizes tactility, embodied experience, affect and perception in space, often involving displacements that heighten our sensory awareness. In this respect, his work finds good company with pioneering contemporary artists from Duchamp to Eliasson. A case in point is Virtual Mirror – Rain, which received Honorable Mention at Prix Ars Electronica. The artist has somehow managed to achieve what might at first seem impossible: rain falling from the skies outside the gallery triggers an equivalent amount of rain "falling up" inside the gallery! Read more about Yolande Harris "Sun Run Sun"